I am currently waiting for ACL reconstruction and here is my story: In 1982 when I was 16yrs old I tore my ACL playing basketball. After surgery I wore a full(and I mean full) leg cast for 12 weeks! Never really had a problem...Until now. 2 years ago at age 41 I re-injured it playing soccer. There was a loud pop and down I went. A bit of swelling(although nothing too great)occured and some instant pain but it subsided quite a bit in an hour or less. X Rays and MRI showed no damage to the ligaments or menisci. I was sent to physio for a while and it began to feel better but still it felt very loose and sore. I did not play any sports(I enjoy hockey, soccer and skiing)until January of this year because it was constantly sore and felt weak. Finally I decided to give it a try skiing. 3rd day out I went over a little bump and when I landed...argh!! Down I went! Lots of pain. Back to the Dr but still no evidence of any damage. 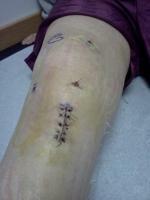 My knee was very loose though when manipulated and the Dr said the 27 year old surgery was probably the cause. The original surgery was known to break down after time. He recommended a custom brace which I bought ($1000 Cdn) and it worked great for 2 weeks. I was playing soccer again and jumped up and when I landed..down I went. I did not go to the Dr this time as I was convinced he would just tell me the same thing again. In September I finally broke down. My knee has given out and I have gone down on it probably 6 or 7 times in the last 6 months and I had been having pain on the inside and behind the kneecap. I went for another MRI and now I await ACL reconstruction combined with a medial meniscus repair. I had the option to just have the meniscus repaired but I am tired of falling anywhere for no apparent reason. Heck ya, but this reading this site helps alot! And, I really want to ski again!